While today’s RVs come equipped with all the conveniences of home, sometimes you want to make use of everything you’ve got even when you’re boondocking miles away from the nearest power pole. For that, you’ll need a generator. So, do you really need a full-size RV generator? Or will a portable generator be enough? 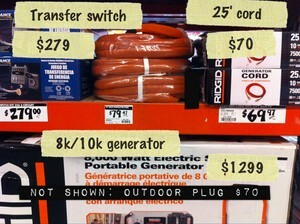 However, if you can’t afford an RV class generator right now, then a portable generator is a viable option. Choosing the right size portable RV generator takes a bit of mathematics — because when it comes to having enough electricity to do the job, size does matter! You want a generator with a high enough wattage to do the job, but not so large that it’s excessively noisy or consumes too much fuel. Don’t forget, in order to keep your RV generator working properly, you need to maintain it regularly. This applies to both RV class generators and portable generators!